Just as we are holding a meeting here for a few days, a similar meeting was held at least four thousand years ago in a place called Naimisaranya. Naimisaranya is in India and is situated near Lucknow. The place is still existing, and if one goes to India he can visit it. Its atmosphere is very conducive to spiritual undertakings. Formerly all the great sages used to assemble in the forest at Naimisaranya, and it is said that all the demigods used to visit there. It was at Naimisaranya, at a meeting of great sages, that Srimad-Bhagavatam was discussed. Srimad-Bhagavatam was first imparted to Maharaja Pariksit by Sukadeva Gosvami. Maharaja Pariksit, who was emperor of this planet, was cursed by a brahmana to die within seven days. Although he was very wrongly cursed, Maharaja Pariksit nonetheless tolerated it. He could have counteracted such a curse, but he did not do it. Instead, he took the opportunity to retire from active life and prepare for death. He had only seven days to die, and because he was king of the earth, all the great sages and kings from all parts of the world came to see him. The problem they discussed was what to do at the time of death. 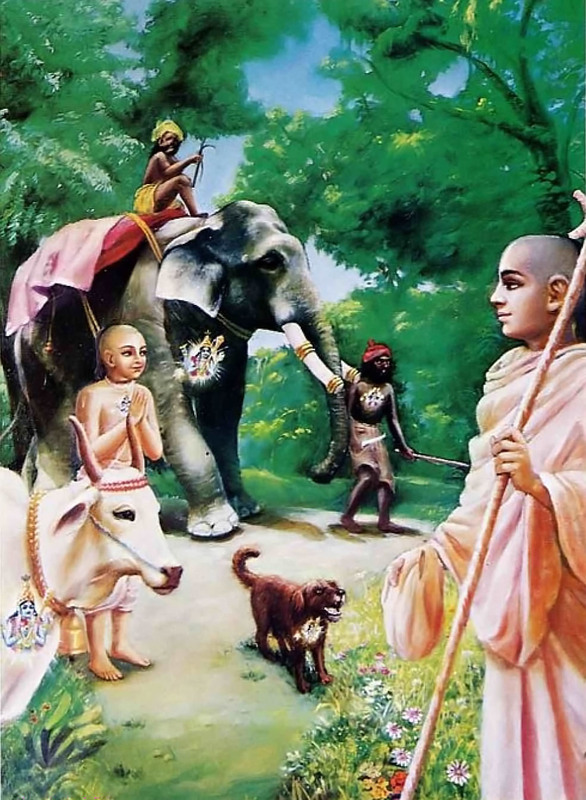 Many great sages and brahmanas made numerous suggestions, telling him, “Maharaja, you simply have to do this, or do that.” Later, at the arrival of Sukadeva Gosvami, it was decided that Sukadeva Gosvami, who had recently learned Srimad-Bhagavatam from his father, Vyasadeva, could impart that knowledge to the King. Srimad-Bhagavatam was Vyasadeva’s last contribution. It was Vyasadeva who was the original compiler of all Vedic literature. He wrote many books—the four Vedas, the 108 Upanisads, eighteen Puranas and the 1,400,000 verses of Mahabharata. These books contain hundreds of thousands of verses, and Srimad-Bhagavatam alone contains eighteen thousand verses. In this way Vyasadeva compiled so many books for the benefit of people in this Age of Kali. Unfortunately, people are not interested in these literatures. Even the people of India have lost interest, and what to speak of people of other countries. They are busy doing research, but they are neglecting the mature research already carried out by Vyasadeva. This neglect is the misfortune of India. At any rate, Vyasadeva summarized all the Vedic literatures in the Vedanta-sutra. Veda means knowledge, and anta means end; thus the ultimate goal of education and knowledge is vedanta. If one knows vedanta, he knows everything, for vedanta means ultimate knowledge. Yasmin vijnate sarvam eva vijnatam bhavanti. Yet after compiling Vedanta-sutra philosophy, Vyasadeva was not satisfied. Because he was feeling some vacancy and was sorrowful, his spiritual master, Narada, appeared before him. Narada could understand that Vyasadeva was not happy even after compiling so many great volumes of Vedic literature, and Narada addressed him as Parasarya, for Vyasadeva’s father was Parasara Muni. That is a fact. At the present moment also there is great educational advancement. There are many universities and technological institutions, and there is economic development to such an extent that in America there is sufficiency of everything. Yet people are unhappy. The youth especially are becoming disillusioned. Why? The answer is that there is no knowledge of God. This is the only cause of unhappiness. Every one of us is part and parcel of God, and because of this our real hankering is for God. A child is similarly part and parcel of his mother, and when he is unhappy, nothing can satisfy the child but the lap of his mother. Although everyone may try to pacify the child, he will go on crying and crying till he reaches his mother’s lap and is nursed by her. Similarly, we are all children of God, but we are making plans to be happy independent of God, and that is not possible. One who is spiritually aware sees everyone equally. This was the main question. It is significant that Krishna is mentioned here as Yogesvara. The word yoga is very popular in the West. Generally the word yoga means mystic power, for if one actually becomes a yogi, he attains many mystic powers. A yogi who has actually attained perfection can become smaller than the smallest and can fit himself into the smallest compartment. If he is imprisoned, he has the ability to come out through the smallest hole imaginable. This is called anima-siddhi. Similarly, by laghima-siddhi, a yogi can float in the sky just like a cottonflower, and by other powers he can produce whatever he desires on the spot. There are in this way many siddhis, or perfections. Indeed, the very powerful yogis can even manufacture a planet. Visvamitra Muni, for instance, produced men from trees. Thus yoga is not simply a matter of pressing one’s nose and holding the breath; yoga is practiced by real yogis to get material power. 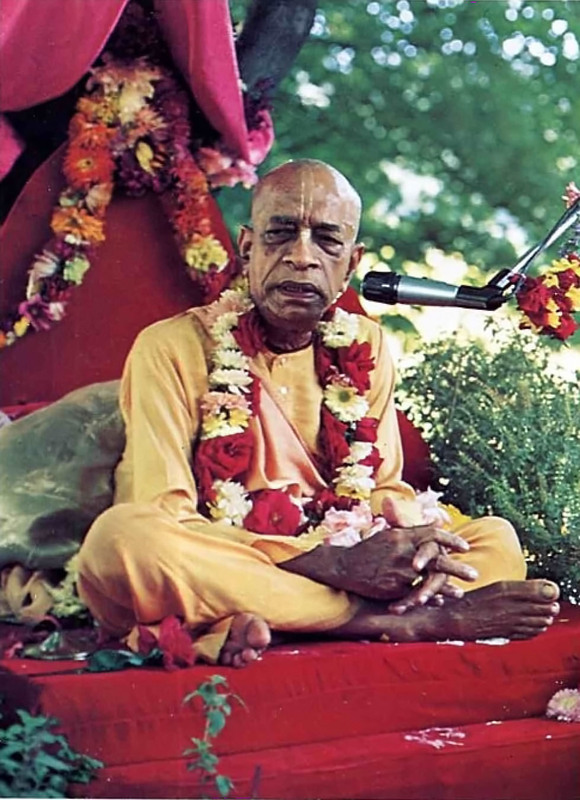 There are many yogis who can perform such magical feats, but all of these accomplishments are quantitatively small when compared to the powers of the Lord. A yogi may be able to float himself in air, but God, by His yogic power, can float millions and trillions of planets in space. The supreme yogi is Krishna; therefore it is said, bruhi yogesvare krsne. Isvara means controller. There are many yogic powers and yogis, but Krishna is the supreme controller of all. 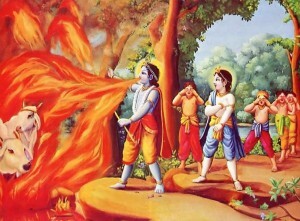 Thus it is mentioned in this verse that the master of all mystic powers, Krishna, has left the planet. Brahmanye dharma-varmani. Dharma-varmani refers to Him who embodies religious principles. The Sanskrit word dharma actually refers to God or Krishna. Generally dharma is translated into English as religion, but this is not a perfect translation, for dharma is different from religion. Religion is usually defined in a dictionary as a kind of faith, but dharma is not really a faith. Faith can be changed. Today a man may be a Hindu, and tomorrow he may be a Moslem or Christian. Faith is not, then, actually dharma, for dharma refers to that which cannot be changed. Water is liquid and cannot be changed into a solid. One may argue that water may become solid as ice, but that is not its natural condition. That is artificial. The solidity of water as ice is temporary, and as soon as the temperature rises, the water returns to its natural condition. As liquidity is the natural state of water, similarly dharma is the natural state of the living entity. Krishna is protecting His devotees from the devouring flames of a forest fire. Thus Krishna came to establish real religion. 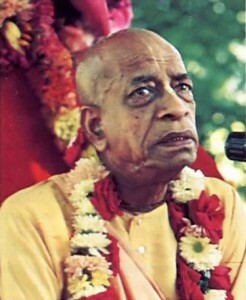 Krishna sages assembled at Naimisaranya knew the mission of Krishna. They knew that He came to establish religion, and they were wondering, since Krishna was no longer on the planet, under whose care religion was entrusted. Dharmah kam saranam gatah. 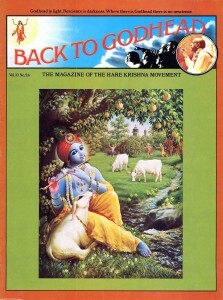 As long as Krishna was present, He was discharging real religion. How was that? Paritranaya sadhunam vinasaya ca duskrtam: He was killing demons and giving protection to His devotees. Since Krishna is absolute, both His killing and protecting are the same. This, then, is the main question of the sages of Naimisaranya, and it is answered first by Sukadeva Gosvami’s disciple, Suta Gosvami. We may theorize about so many things, and we may be great scientists, but when death comes, we cannot protect ourselves. We should not think that material nature is working independently; that is not possible. Matter cannot act independently. We may see that matter is working, but actually we are superior. Scientists may see that a molecule is working in this way or that way, but one who is seeing this activity is actually superior. Matter works under certain material laws, but in actuality the living entity is superior, and of all living entities, the supreme living entity is God. This is the verdict of the Vedas: nityo nityanam cetanas cetananam (Katha Up. 2.2.13). Nitya means eternal; God is eternal, and we are also eternal. Cetananam: God is full in knowledge, and we have some knowledge. Dull matter has no knowledge. Krishna is the supreme eternal, and He is supremely cognizant. Eko bahunam yo vidadhati kaman (Katha Up. 2.2.13). Krishna is singular, and the living entities are plural; God is one, and the living entities are many. There is no limit to the living entities. We have experience of this, for even within our room thousands and thousands of ants may come out of a small hole, and even within a drop of water there are thousands of microbes. These are all living entities under different conditions of life. Thus the living entities are many, but God is one. What is the distinction between the plural living entities and the singular supreme living entity? It is that the supreme living entity is supplying the plural entities with all necessities. As civilized men, we have industries and businesses to solve our economic problems, but we human beings are but a small part of the many living entities. According to Padma Purana, out of 8,400,000 species of life, different types of human beings comprise only 400,000 species. Out of these, 75% are uncivilized. Aside from the small number of civilized human beings, other living entities have no problem eating, sleeping, defending and mating. We have created so-called problems by our civilization. Otherwise, there is no difficulty. Elephants eat a large quantity of food, but God is supplying it for them, and they also have sleeping arrangements and mating arrangements. The same can be said for the other species of life. An educated man should understand that if God makes such arrangements for other living entities, he makes them for man also. Sa-vijnanam: it is a great science. If we try to understand God, we have nothing more to understand. All knowledge is there; God is everything, and if we understand Him, we understand everything. Therefore Suta Gosvami proclaimed that the great sages’ questions about Krishna are so nice that they are auspicious for the entire world. 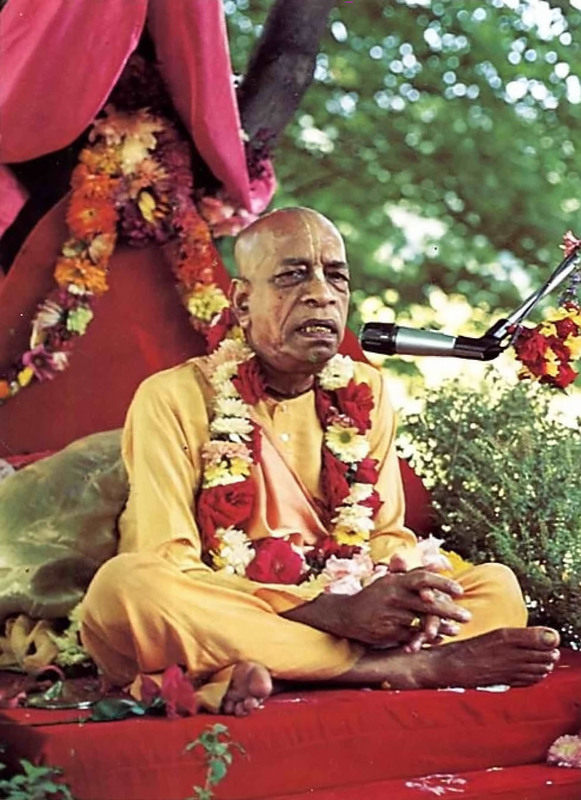 We have begun this Krishna consciousness movement, and it is not for our personal benefit; it is good fortune for the whole world. We should all try to inquire about Krishna and try to understand Him. Yayatma suprasidati. In this way our soul (atma) will feel satisfaction.